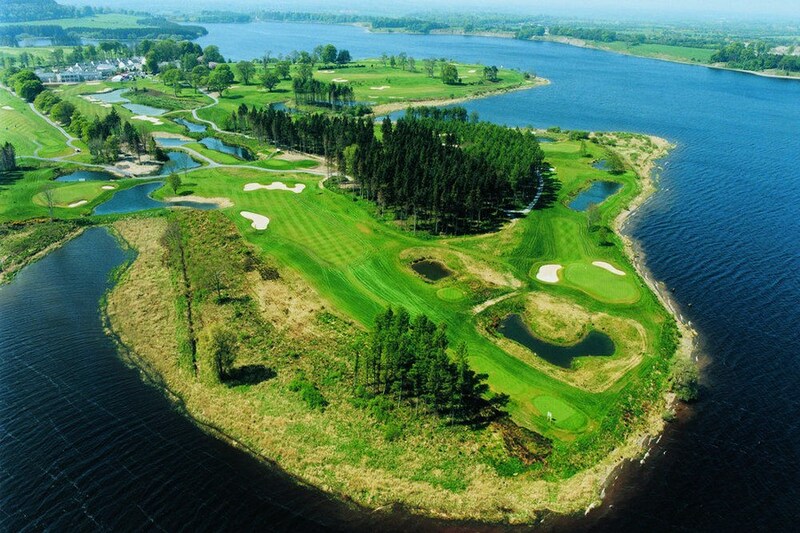 Tulfarris Hotel & Golf Resort is surrounded by 200 acres of beautiful woodlands, overlooking the Blessington Lakes and the Wicklow Mountains. Offering 59 guest bedrooms in the Main Hotel and 7 restored guest bedrooms in the elegant 18th century Manor House. Guests can avail of the 18-hole championship golf course, 2 outdoor tennis courts, an indoor games room, 2 treatment rooms, outdoor play area for children and a large terrace area. 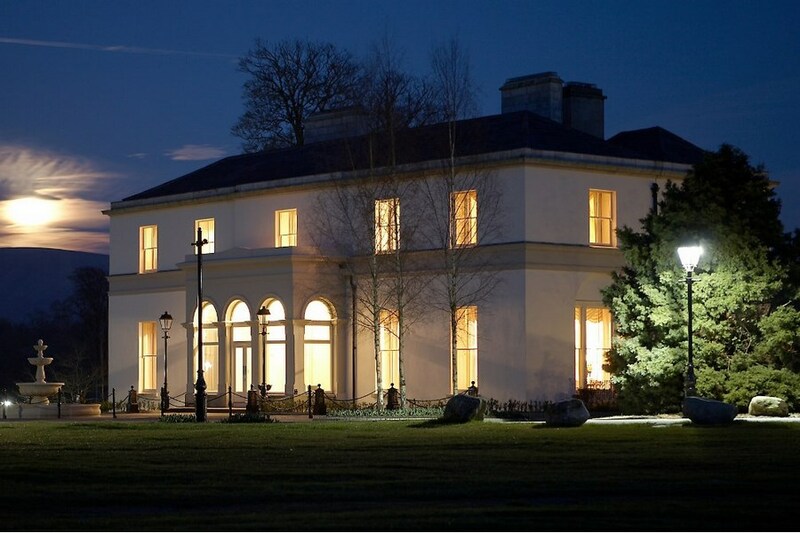 The Lime Tree Restaurant is located on the first floor and has stunning views over the 18th hole, it offers spectacular European cuisine and fine wines in an elegant space. Informal dining is offered in the Elk Bar and Lounge, where you can sit back and enjoy the grand piano playing at weekends. Driving Directions from Dublin.Take the N81, follow over the M50 towards Tallaght/Blessington. Continue driving on the N81 (about 15km), you will come into Blessington Village. Continue straight through the village, and follow the road down into Poulaphouca (about 5km) where you will pass the power generation station.You will come to a hard bend in the road, continue slowly and follow the bend around. Take the first left turn after this bend (approx 100 metres further on).Take this turn, and continue to the top of the road. Veer left, and follow the road until you come to the next left turn (also sign-posted). Take this left turn, and you will find Tulfarris located about 1km down on the left-hand side of the road. Located just 1 hours drive from Dublin City and Dublin Airport. Tulfarris offers 200 acres of woodland which is worth exploring, with on and off-site walks and trails. The on-site walks are focused around the golf course which means they can only be walked by our guests during twilight hours (summer - after 6pm). Glendalough, Russborough House and the Dublin/Wicklow mountains are all worth a visit. We enjoyed a truly fabulous one night stay. Room was very spacious and immaculately clean. The meals were excellent and all staff were particularly welcoming, helpful and attentive. We will be going back as soon as we can. Stayed one night here in September. Staff really nice, room was very large, which was nice, and bed was a 6 foot wide one. Could have done with a blanket, as all that was provided was a heavy duvet, and it was much too warm. The food was excellent, and we will be back for more. Recommended. A really nice hotel with a relaxed and friendly atmosphere. The staff were incredibly friendly and helpful and the meal served in the restaurant was top quality. Will definitely stay again. enjoyed a one night stay here. had emailed to request a bottle of bubbly in our room as was celebrating an anniversary and the lovely laura had this all set up for me and included a very nice card and chocolates too, how nice! the bar is lovely, food is great and restaurant fantastic...our waitress also wished us a happy anniversary at dinner which was such a nice touch. all the staff were extremely friendly which made the stay even better! will 100% be back for another stay! Absolutely fantastic hotel!! The staff could not have been any nicer - we arrived at 12:30 and were able to check in not a problem. We went to the treatment rooms and the facials were the best facials we have ever had!! we also had dinner here and again the staff were amazing!! we didn't know what to expec going to Tulfarris but we will 100% be back! We were very pleased with our stay at Tulfarris Hotel & Golf Resort recently. The Reception we received from Roisin was excellent, our room was very comfortable and the food was first class. We both very much enjoyed our stay. We also played golf and found the course in great shape and the greens were excellent for the time of year. We hope to pay a return visit in the New Year. Star Rating 5 out of 5. Had a brilliant night at Tulfarris. Staff were excellent food was excellent. Will definitely recommend and will be back again. enjoyable stay , great host in restaurant, breakfast lovely especially for a buffet. The hotel is in a lovely location and has some beautiful features. The staff were friendly and the food in the dining room at dinner was excellent. The breakfast buffet was disappointing and a number of items that were listed as included on the breakfast buffet menu were actually not available. I have several issues with the room and how it was serviced: 1) There was no hairdryer in the room and I had to make two requests before one was provided; 2) The shower hose was damaged with the result that there was almost no water coming through the shower head. I reported it and a new hose was provided and the shower worked much better. However the hose was made of cheap plastic and constantly twisted and smelled terrible; 3) After the first night of our stay, we left the hotel at 10:30am and made sure to put up the sign on the door to say that the room could be serviced. However, when we returned after 5:00pm the room had still not been cleaned. I reported it and someone came to clean the room within 15 minutes, however they only provided one hand towel instead of two, so I had to request an additional one; 4) The sound-proofing in the rooms is quite poor. We could hear people in the bathroom and the toilet flushing as well as conversations from other rooms. I believe that some of these issues could be resolved with additional staff training and supervision and checking rooms every day to ensure that they are up to standard before guests arrive. A fantastic stay from start to finish. The location is beautiful. Hotel room was lovely, big and comfortable. Excellent food, with great views from the dining room. Friendly staff. Will definitely re-visit. Beautiful hotel in a peaceful, idyllic setting. Food was excellent, served in the restaurant on the first floor overlooking the golf course. All was wonderful, but the best thing about this hotel is it's staff. The typical hotel from the book type reception was there, which shows professionalism, but I found the staff here took it beyond that and were genuine and friendly and so helpful. Very enjoyable stay and a huge bargain at the price. Lost a star only as we were travelling with a 6 year old and there is no swimming pool or playground on site, which would have helped to keep him occupied. Ample space to run around outside and take walks though and lots in the area to see. Perfect in every way. Lovely friendly attentive staff. rooms are v special , with big double shower. Quiet calm surroundings. Lovely walk to the lake and back. Bar staff v attentive. Food is the very best. Beautiful hotel, stunning location views go on forever.hotel rooms were really big and stylish. Food was amazing and staff were very friendly. The spa is worth a visit to. Definitely be back. We stayed on a Saturday night when the hotel was fairly busy. The staff were very courteous and friendly from the moment we arrived until our departure at noon on Sunday. We had a delicious meal on Staurady evening in the Lime Tree restaurant, one of the best meals we have ever had. Unfortunately the weather was not good so we did not have any opportunity to venture out. Our room was lovely, no complaints. Offered an upgrade to the first room by the reception which was a suite. Rather a small bed for a suite. I could hear the hand drying machine from the gents right next door and there seemed always to be a stench of smoking outside the door. Noisy too in that room with drunken singing at 2.30 am and again at 4.30 am. Could hear voices coming from the reception area all the time. Not really then an upgrade-au contraire. The included dinner was ok but annoying that was shown the dessert menu and chose a main and dessert as a result only to be offered a different dessert menu when the time came with none of the same choices. A somewhat dull breakfast with limited choice. Not too bad for Ireland but not great either. Most friendly and helpful receptionist ever, so lovely and great first impression of hotel. Everything about the hotel was exceptional, and I don't give praise lightly. It was clean, stylish, roomy with excellent service in both bar and the restaurant where we had dinner. Food was beyond good and service in both places attentive and efficient. Also thank you for the extra drink to celebrate my partners birthday, nice touch. Room itself was well equipped and comfortable with a nice view. I could go on but suffice it to say I was very pleased with my stay, and although short and sweet this time, I hope to be back for a longer visit in the future. Stayed recently for one night. Got a great rate which included two course evening meal as well as breakfast. The hotel is fantastic,great views across golf course. We were upgraded to a suite which consisted of a large separate living area as well as bedroom and bathroom. The rooms were large,extremely clean and had everything we needed. The staff at check in and around the hotel were exceptionally courteous and helpful. the evening meal in the Lime Tree restaurant was fantastic as was buffet breakfast next morning. I would certainly return to this excellent hotel and would have no hesitation recommending it to friends etc. This was a lovely hotel in a really beautiful area. The bar was really nice and cosy and the restaurant was lovely also. The staff we're all really professional and friendly and very attentive. The hotel itself was a normal hotel I guess, nothing too fancy. The manor house looked lovely and I've seen photos from weddings there and it looks beautiful when decorated. WE REALLY ENJOYED OUR STAY. 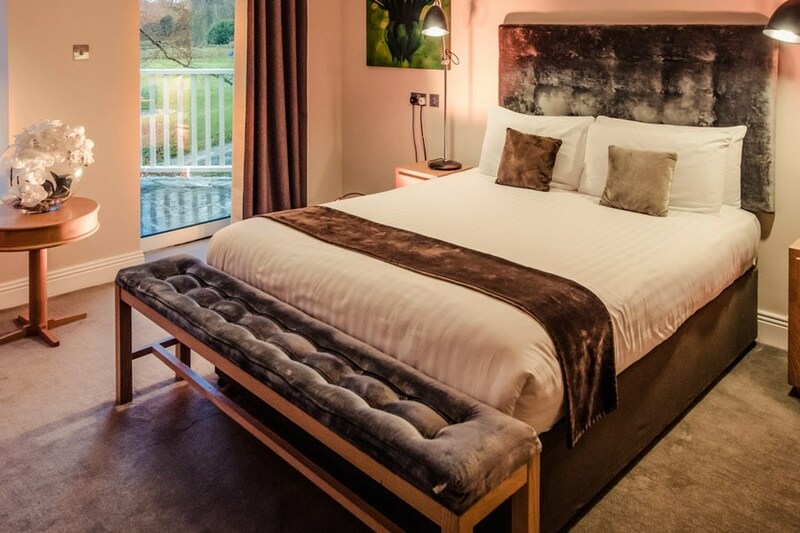 WE LOVED THE LARGE CLEAN BEDROOM AND BATHROOM, THE RESTAURANT VIEWS OF THE GOLF COURSE AND THE FOOD WAS EXCELLENT . WE WOULD HIGHLY RECOMEND THE HOTEL TO FRIENDS AND FAMILY AND WE WILL VISIT AGAIN. Had a lovely relaxing night away on Friday 1st April. Nice hotel and very pleasant staff. Excellent all round - great friendly staff, good facilities, nice size family room, great walks around estate, good food and nice price. Lovely stay. Peaceful surrounding and good food. Staff very friendly and helpful. The hotel itself is in a lovely quiet location. The staff are fantastic and and eager to please. We found the lunch and dinner menu very limited. I had an breakfast sandwich for lunch which consisted of one sausage cut into slivers and one piece of bacon (you cannot order just a plain sandwich of your choice if it's not on the menu). The lunch menu is very poor if you just want a sandwich. Dinner was a bit of an ordeal as there was only one chicken dish and one beef dish, if you like fish both lunch and the dinner menu is fantastic. I had the beef medallion which I asked to be cooked well done it was cooked so much it was like rubber and covered in pepper sauce(the resturant manger took our drinks and desert off the bill), my husband had the chicken no complaints from him he really enjoyed it. We found the bed to be a little small and the matress very hard. The room itself was lovely but it was let down by the pillows and duvet that felt cheap. The bathroom was very clean and decorated in great taste. Breakfast is self service which I don't like especially I a 4* hotel. We cannot praise the staff enough they where we'll mannered and polite. I don't think we would stay there again as the menus are very limited and we like to enjoy a wide range of food and the bed very hard . Had a most enjoyable girls night recently. We were allocated an Extremely comfortable room accommodating the three of us. Our fabulous dinner with excellent service corresponded well with its poetic description! We sat for ages chatting in the bar and next time hopefully we will book the armchairs at the roaring open fire in the lobby. Breakfast was lovely and leisurely with super views towards the lakes where we went for a stroll later. It may have only been for the one night but we certainly felt treated and revived. We will definitely be back. I also intend to return with my husband as we are both keen hill walkers and tulfarris is only a short spin to the mountains. Can't wait! Excellent hotel. Friendly staff and the music on the Saturday night was of a high standard. Only shortcoming is that they do not have full TV sports package in bar(no Setanta or BT Sport) and also cannot change a station if the members bar watching a different programme. Service, hospitality and food top class. Had a lovely overnight stay with three friends. Rooms lovely, warm, clean, comfortable. Staff very friendly and efficient. Only negative comment is no fire place in bar which meant it was very cold in athmosphere and temperature. There was a lovely fire in lobby. We only stayed 1 night, but it was a very pleasant stay. Excellent value. Didn’t get a chance to explore, but the grounds looked fabulous. Meal menu didn’t look to be great at first but the food turned out well presented and very tasty and no problem finishing it. No problem recommending this Hotel. Fab hotel, in a stunning setting. Lovely rooms, great food. I would recommend this hotel for anyone looking for a relaxing break. Beautiful setting, lovely room, friendly staff, great food and a real fire in the lounge all made for a perfect break! Setting beautiful, rooms perfect and staff very helpful and friendly. Food ok. Will be back. Spa treatment amazing value snd so relaxing! Enjoyed our stay in this beautiful hotel. Everything was top class. Hope to visit again in the near future. We really enjoyed our sray. Our dinner was beautiful. The staff were very friendlt and helpful. Ivwiyld highly recommend this hotel. Had a lovely 2 night B&B and 1 dinner break recently. Excellent value for money. We were greeted by a very friendly receptionist and allocated a large suite overlooking the garden. The dinner was delicious as was the breakfast. Rarely do I get my poached eggs perfect (whites cooked and yoke runny) but these were perfect. The staff in the restaurant and bar were extremely pleasant and helpful. Only downside is you have a 10 minute drive to the nearest town but if you want beautiful walks and a game of golf this is the place to go. By Lorraine on 10th March 2015. My sister and I stayed in Tulfarris for a one night break. We were delighted with the hotel and the large suite room that they allocated for our stay. The staff from reception to the restaurant were friendly, helpful and efficient. A special note of thanks to Sean in the restaurant who looked after us and served us a lovely evening dinner, which we both enjoyed immensely. We are both looking forward to returning again soon in the near future, for another relaxing break in Tulfarris. Stayed here Feb 13th and had a most enjoyable evening. We had a lovely, spacious double room with a balcony and a very large bathroom. Beautifully decorated. The Restaurant Manager was most accommodating when I foolishly forgot to book dinner but he managed to secure a table for us despite the hotel being very busy. Lovely dining room with high ceilings, attentive staff and it felt like I was in a restaurant in town rather than a hotel. I could not fault the food and we had so many delicious options to choose from. Thoroughly enjoyed my stay as it was most relaxing. My only complaint was that I thought there could be more food on offer for breakfast. There were no nuts, cereal, porridge, range of breads so breakfast was a little disappointing after the great meal we had the night before. The grounds are wonderful to walk around. I would recommend this hotel to anyone and I have! My sister and I recently stayed at Tulfarris Hotel, we were most impressed with the hotel. The staff, from reception to restaurant were friendly, helpful and efficient. The breakfast and evening meal were excellent, we are both looking forward to returning again in the near future. What a find--a beautiful location, friendly and efficient staff and great accommodations and restaurant--a perfect combination for a perfect ending for our visit to Ireland. The heated floor of the bathroom was very welcome on late night visits to the potty and the view of the golf course from both the restaurant and bar was to die for! We highly recommend the B&B plus two course meal--great value and super in presentation and taste. We got to watch our first Gaelic football game--the All-Ireland Final between Donegal and Killarney and since we had traveled through regions during our trip it was really fun to learn the rules from a young couple seated nearby and enjoy true non-stop action--much different from the American football that we are used to. This location is highly recommended by us and we hope to be able to visit it again in the near future. Great hotel for a short break. Beautiful location just outside Blessington. Bedroom was spacious and bright. The Bathroom was a not great, more like a wet room, not very romantic for a couple. We dined in the Lime Tree restaurant overlooking the golf course. Food was really good, I'd highly recommend it. Service was excellent and staff were really nice and friendly. Ordered breakfast to the room and it was equally as good, one of the best hotel breakfasts I've ever had. Might be a bit boring for non-golfers. This was a really enjoyable break. We had a great experience and would return again without hesitation.